The European Institute for Gender Equality (EIGE) launched the first Gender Equality Index for the European Union on 13 June. ’The Index, the fruit of three years of hard work shows differences in outcomes between women and men at the individual level in EU Member States’ said Virginija Langbakk, the Director of EIGE in her opening speech. ‘This unique measurement tool supports evidence-based policy-making and indicates where political priorities should be shifted to accelerate the process of achieving a gender-equal Europe.’ Though gender equality values have long been recognised, the European Union is only halfway towards a gender-equal society, with an average EU score of 54 (where 1 stands for no gender equality and 100 for full gender equality). Thereafter, EIGE’s team presented the features of the Index and the long-awaited results. Gender expert Anne Laure Humbert focused on the contextual framework in which this tool was developed and the value it adds as a composite measure of gender equality in the EU. 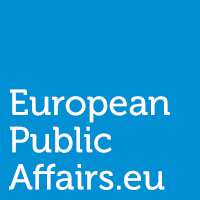 The Index includes the expertise of the National Statistics Office and the experts of the National Machineries of the EU MS which take part in the consultation process, and instead of focusing solely on women’s empowerment, it is working with an equal ‘gender-approach’, examining what is happening to women and men together. Herman Van Rompuy, President of the European Council, also held a keynote speech at the conference emphasising that ‘gender-sensitive statistics help us better understand the hurdles we need to bring down to make all citizens truly equal, and the Gender Equality Index does just that. In our fight against unemployment, improving job opportunities for women is a matter of fairness, but it is also good for society and good for the economy’. The Gender Equality Index was already proposed by the European Commission in 2003 when it was developing the “Roadmap for Equality between Women and Men 2006-2010” and subsequently included in the “Action Plan of its Strategy for Equality between Women and Men 2010-2015”. The European Institute for Gender Equality (actual set-up in 2010) already included the Index in its very first “Mid-Term Work Programme” to show its dedication. The aim was to construct a composite indicator that reflects the multi-faceted reality of gender-equality and is specifically tailored to the policy framework of the European Union. Developing this tool and defining its domains required three years of hard work but the results speak for themselves. 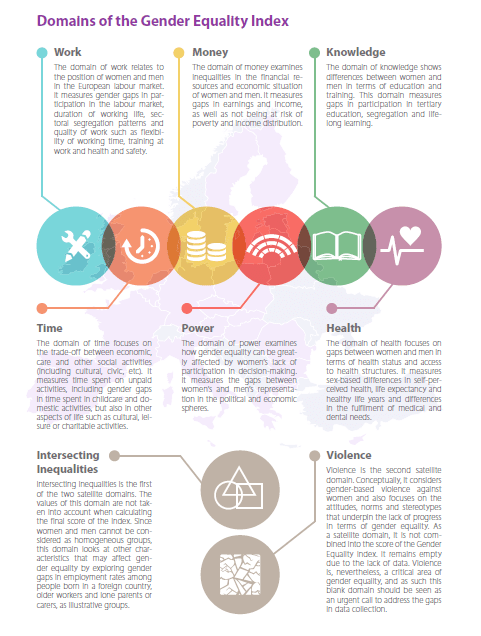 The Index provides scores for each Member State and presents an EU average in the following critical areas of gender equality: work, money, knowledge, time, power and health (further divided into sub-domains). The areas of intersecting inequalities (e.g. age, citizenship, social class) and violence are also considered as areas to be considered, but treated separately as they adopt a different perspective. The latter is a wake-up call for the Member States as throughout the development of the Index it turned out that only a handful of countries possess measurable data on violence against women. When Anna Rita Manca, the Statistics Officer of EIGE presented the main findings on the six areas, it turned out that the lowest score is in ‘power’ in decision-making with an average score of only 38 at EU level: the EU and Member States need more women in decision-making roles. The greatest distance from gender equality is apparent in the representation of women and men on boards of the largest quoted companies and central banks. The other area that really needs attention is ‘time’, within the ratio of paid work and caring activities. The European Union could more quickly reach the employment target set out in the 2020 growth strategy – at least a 75% employment rate of the EU population aged 20-64 – by improving gender equality in the area of time spent on unpaid caring and domestic activities. Women’s participation in the labour market is limited due to their disproportionate involvement in caring roles. The Gender Equality Index shows wide differences between women and men in this area, with an average score of only 39 at the EU level – well below halfway towards gender equality. To ensure sustainable growth for Europe, it is important to assure the equal share of hours spent on providing care between women and men. In parallel with creating new employment opportunities, it is crucial to improve childcare provision and to intensify efforts to increase the involvement of fathers in childcare. In addition to these shocking figures, it also turned out that though the situation improved in the area of ‘work’ and regarding ‘knowledge’, there are many more women in tertiary education than men, yet they still face high levels of segregation. This means that in the labour market women are more likely to work in the sectors with lower incomes: education, human health and social work and their number remain low at universities in the fields of technology and science in all Member States. At the end of the conference the Gender Equality Index team of EIGE and Mikael Gustafsson, chair of FEMM Committee expressed their hope with one voice that this tool will be a great help to policy makers and Member States will make a great use of the feature of the Index that it gives them the possibility to measure their progress in gender-equality over time. NextWelcome to Croatia, the European Union’s 28th member state!